Russell Howard is the host of Sky One's hit The Russell Howard Hour, having built a reputation presenting the likes of Russell Howard’s Good News on the BBC between 2009 and 2015. He's also been snapped up for a Netflix special, releasing Recalibrate at the end of 2017. Howard began his career with radio work for the BBC, before making regular TV appearances on the likes of Mock The Week, Never Mind The Buzzcocks and 8 Out Of 10 Cats. He has since secured a number of ongoing series, from his BBC and Sky One residencies to the likes of Russell Howard’s Stand Up Central and Russell Howard & Mum: USA Road Trip for Comedy Central. 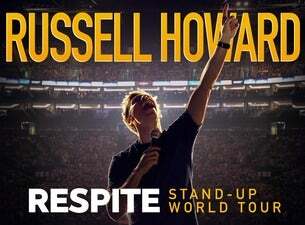 Howard is bringing his latest show Respite on the road in autumn 2019. The UK tour follows the record-breaking success of Round the World in 2017, and marks the comedian and presenter’s biggest global stand-up tour to date.